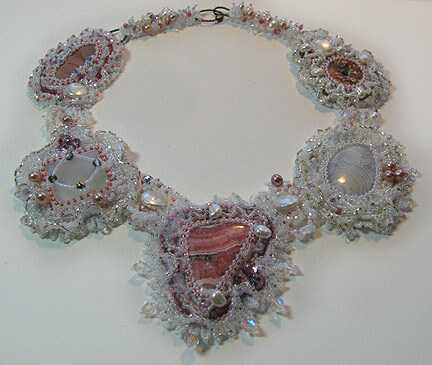 Beading Arts: Celebrate "Seed Bead Month" with Beading Arts! You must know by now that this is my favorite month of the year! Not March, per se, which we lovingly refer to as "mud season" in New England. Rather, I mean the month that we Celebrate Seed Beads and all the amazing things you can do with them: string, weave, embroider, loom, etc etc. During this month, I'm going to share some new projects for those of you who are old hands at working with seed beads, plus some super simple projects and information for beginners. We'll be looking at a round-up of information that's in our archives here on Beading Arts too, and I'll also point you to the fabulous work done by artists you may not know. I want all of you who love seed beads to join in too. Whether you string, weave off-loom or on a loom, embroider, glue, or whatever else you can think of doing with seed beads, either wearables or non-wearables, we want to see your work. You don't have to be a pro...you just gotta tell us why you love 'em! Please send your artist statement of one to two paragraphs, and up to three images (72dpi res) of your work, along with a link to your site to cyndi @ mazeltovjewelry.com (remove the spaces). Please put Seed bead artist in the subject line. I am looking forward for the month (though not a seed bead expert). Sure it's going to be inspiring, educational and an opportunity to see new artists' works.